If you are interested in exhibiting at this event, an information sheet and application form are available to download on our Contact page. There are many more exhibitors to be added to this page, so do please check back again. I am a Welsh artist based near Aberystwyth in the Dyfi Valley. My work is closely woven with my love for this land, creating new ways to connect myself to the seasons and the natural world around me. I began creative knot weaving many years ago working mainly in embroidery threads and beading, creating jewellery and small pieces. Over the past few years my work has grown and I now create on a much larger scale using mainly jute twine and recycled cotton cord. I use only natural, biodegradable, ethically sourced materials. I am always searching for new ways to weave more from this land in to my creations. Using a combination of found objects; nuts, seeds, drift wood and cones. With natural dyes; nettle, birch, gorse, oak, alder. I am creating pieces that resonate strongly with my surroundings and are rooted here in this land. Border Bears is the craft side of my small sheep farming business. Graig-Fach, an all-grass farm in the hills of east Monmouthshire, is home to my flock of coloured Corriedale and Romney sheep. I specialise in the production of fine fleeces, in a variety of colours, for sale to hand-spinners and felt-makers. In order to ensure that I can keep my sheep in the manner to which they are accustomed, I also use their wool to spin, felt and needle felt a range of woollen articles for sale. These include hand-spun yarns, sturdy shopping bags, slippers, cushions, personalised place-mats and all sorts of small needle-felted creatures. I also enjoy running needle-felting workshops and doing my best to convince the world of the merits of wool. 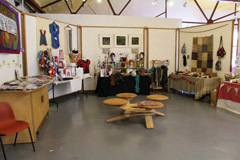 website Wool and willow products, hand-woven scarves, cushions and rugs using natural fleece. Willow baskets, garden products, living willow structures and willow coffins. Workshops in both willow and textiles. This wool comes from a sheep flock which I have been carefully cross-breeding for over 30 years to produce high quality naturally coloured wool. Breeds used are mainly British rare breeds plus a few foreigners, including Merino, Icelandic and Gotland. Being already coloured, no dyes are needed so no pollution is caused in the preparation of my wool. It is spun at a mill in west Wales where they also weave the throws, very local so low fibre miles. All very eco-friendly. I do the designing and knitting myself. 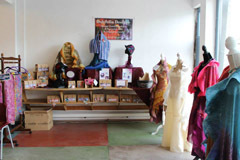 Available: fleeces for spinners, designer knitwear, organically tanned sheepskins, knitting wool, woven throws and scarves. Cwmstwrdy is a smallholding near Llanidloes where I breed a small herd of angora goats and a flock of Bowmont and Shetland sheep to provide fine fleeces to craft workers. Mohair and wool are available as raw or washed fibre and spun yarn in their natural colours or dyed with plant dyes ready for all your crafting projects. I weave and knit items such as cushions, blankets, scarves, hats and socks using my own handspun fibre and re-homed commercial yarn. I will be running a workshop ‘Meet the goats, spin the mohair’. Please for further details by email or 'phone 01686 411 313 for further details. Spinning, dying, creative knitting and weaving. Yarns for weavers and creative knitters. My yarns are inspired by the natural world, full of texture and native colour. They are ideal for the more creative project, hand spun, dyed and plied in my studio. These yarns are mainly wool with a little extra where a texture or sparkle is needed. I am a Fibre Artist selling handmade homemade items, all inspired by my love of nature, fairies and fantasy stories. I hope you love what you see in my shop, My goal is to create beautiful, cozy, fun organic items, that you will love and treasure for a long time. I am a felt maker based in mid Wales, and have been felting since 2012, after discovering felt making by accident. Since then I have found a love for wet felting and love to use bold colour combinations and unusual designs. I especially like making hats and nuno felting, and experimenting with different effects, but I also dabble in needle felting. Sarah Fisher is an experienced feltmaker, working mainly with merino fleece. She often dyes her own fibres, and blends colours to create felt which is vibrant and exciting. She incorporates a range of different materials, in particular silk which can add shine and produce a strong and fine fabric for luxury clothing. Her products range from small items such as jewellery, vases, flowers and book covers, to hats, bags, scarves and wraps. She also creates 3D sculptural pieces. A range of new, second-hand and out-of-print books, as well as calendars, greeting cards etc. Specialising in local books and maps, books on green and ethical issues, children's books and craft books. Mae Eirian yn cynhyrchu basgedi helyg o’i chartref yng Ngharmel, Dyffryn Nantlle. Defnyddir pren helyg o ffyn-honnell adnewyddadwy, gan eu cyfuno gyda defnyddiau Cymreig fel brethyn traddodiadol a chregyn mor, i greu basgedi lliwgar a thrawiadol. Dyma gyfuno ymarferoldeb a chrefft i greu gwrthrych sy’n ddefnyddiol a hardd. Maent wedi cael eu dylunio er mwyncael ei defnyddio, fel basgedi siopa, basgedi ar gyfer y beic, i storio neu fel addurn. Wedi gweithio ym maes Tecstilau am ran fwyaf o’I hoes fel athrawes D a T Mhen Llyn roedd troi at wehyddu hefo pren a’u cyfuno hefo tecstilau yn gam naturiol iddi. Eirian produces willow baskets from her home in Carmel, Dyffryn Nantlle. Willow from a renewable source is used and mixed with Welsh woollen tweeds and natural objects such as shells to make colourful baskets. Practicality and craftsmanship are combined to make practical and attractive products. They are designed to be used as shopping or bike baskets, for storage or as interior design objects. After working for many years as a D and T teacher in Llyn, turning to weaving with willow and combining it with textilesn was a natural step for her. Samantha is a self-taught seamstress. Also known as ‘The Accidental Upcyclist’. A forager and rescuer of all things fabric, trying to save unwanted clothing and textiles from ending up in landfill. Creatively revamping and recreating them into unique, funky upcycled eco-finery, giving them a new lease of life. In 2009, Samantha created the upcycled clothing labels ‘Kaotic Kittus’ and ‘Guto the Whippet’. Based in Swyddffynnon, Ceredigion, Samantha is currently studying Fine Art at Aberystwyth University, with a keen interest in Printmaking and Photography. Mostly inspired by the animal world, nature and landscapes, Samantha is also fascinated by what is seen as ordinary, recreating the mundane into something unique and beautiful, just like in her upcycled creations. “With my photography especially, I just love the ambiguity and interplay of the many shadows, reflections, silhouettes, patterns and strong contrasts that can be created from the simplest of everyday objects and subjects around us, often unnoticed by many, making them into a work of art in itself”. Maria Lalić is a textile artist based in Glamorgan. Her work is inspired by the landscape, legend and people of Wales. She uses creative embroidery, free form knitting and weaving as well as mixed media art techniques to produce wall hangings, pictures and art dolls, rich in both texture and meaning. Maria makes art maps, is currently writing a book on exploring personal creativity and also works as a creative practice mentor with individuals and small groups. She is a founder member of Wilditz, a gathering of NHS escapees who create a range of lovely things, hand-made in Wales. Moving to Llangadfan 10 years ago with my daughter and her family meant a complete change of lifestyle. We took on 17 acres of Welsh hill and bought 6 pedigree Jacob ewes. The flock now numbers 26 breeding ewes. But what to do with all that fleece? We decided to make decorative and useful items from the wool. I had a background in textile work and my daughter was artistic so we had a go. We could both spin, sew, knit and crotchet and soon added felt making to the list of skills. At the outset we decided not to use any dyes so we blend the natural colours to achieve a variety of tones. We make whatever takes our fancy and due to the nature of the raw material all items are unique. I have been a keen knitter for many years, and an introduction to modular knitting opened up a whole new area of possibilities. I design and hand knit, or crochet, waistcoats, usually building up the garment from squares, diamond shapes or triangles. The garment often takes its own form as part of the construction process. I use commercial yarns, predominantly a mix of wool and silk and am inspired by their colour and texture. I have recently begun experimenting with using the same technique, but on a smaller scale, to make fingerless gloves. Each of my garments is totally unique. I crochet. 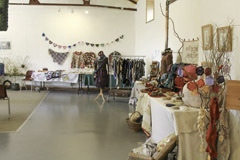 On my stand at The Wool and Willow Festival you will find clothing for adults and children, toys, accessories, bags, baby blankets, hand dyed and un-dyed wool, hooks, innovative patterns and pattern books, crochet hooks, kits and fibre art, which is new for this year's show. If you do not see what you want anything can be made to order. My workshop this year will be How to Make a Crochet Rug. For more information please or telephone 01974 298 105. Leave a message if necessary and I will get back to you. Sue is a textile artist based in Llanddewi Brefi, Ceredigion. She specialises in creative textile recycling. Using a variety of rag-rug making techniques as well as patchwork, appliqué and weaving, Sue recycles old woollen items into rugs, hats, wall-hangings, bags and brooches. Sue designs kits to encourage textile recycling and sells tools and materials for rag-rug making and other textile arts. Sue runs workshops and takes commissions and sells her work at the shop at the Centre For Alternative Technology (CAT), near Machynlleth. I have worked with textiles for many years and love to spin, weave, knit, create and felt. My love affair with felting began when I found a jumper in a charity shop that had been felted, maybe accidentally, and it was then that I had an “ah ha” moment. As I am passionate about re-cycling, re-using all things green, my imagination tends to go rather wild over the endless possibilities of jumper collecting and what delights I can fashion out of shrinking, dyeing, cutting and embellishing. Ali is an experienced feltmaker with a passion for transforming fleece into vibrant felt ‘paintings’. Inspiration comes from a delight in the natural world, local landscape, trees and dwelling places. .
Ali is primarily a ‘wet felter’ and enjoys the challenges of this process. Working mostly with ethically-sourced Merino wool, Ali often incorporates animal and plant fibres, spun yarn and fabrics into her pictures for added texture and interest. Ali will be running workshops during the festival in her small studio near Lampeter, either one-to-one or one-to-two participants at a time. For further details . Tynewydd Alpacas is a farm at Cwmfelin Boeth with a large herd of alpacas; and we make all our products from their fleece in their natural colours. We make gloves, scarves, hats, snoods etc. All our blankets and throws are made by a local mill and are all 100% Alpaca and 100% Welsh. I am a Crafts Woman/Artist, and have been working in Wales since 2001. I completed a degree in Contemporary Craft at Manchester Metropolitan University in 2001, where I specialised in Wood and Ceramics. I set up my business, Wild Witches of Wales/Gwrachod Gwyllt Cymreig, as a sole trader in 2005. In 2009 I completed a PGCE with The University of Wales Newport. I work on a commission basis for private and public. Demonstrations and Workshops: Chainsaw Sculpture. Wood Carving, Relief work, 3D Ceramics, Paintings, Wands and Staffs. I am a weaver and weaving teacher based near Rhayader. I specialise in weaving highly-textured wallhangings, using handspun yarns, scraps of fabric and ‘found objects’’ gathered on my wanderings in the Welsh countryside. I also run a fairtrade business supporting spinners and weavers in Chile, and I use my own range of handspun yarns in my weavings and kits. I learnt to weave in Chile and I now teach Chilean weaving techniques, including decorative tapestry weaving, here in Wales. For my workshop this year I will teach how to weave a decorative tapestry wallhanging using simple textured weaving techniques.